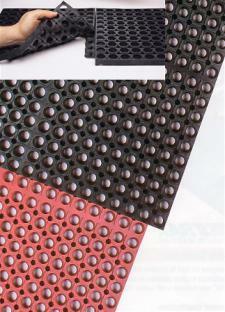 Rubber mats are a great way to keep new employees safe. Do you have training in place for your seasonal staff? In the restaurant business, seasonal staff can help offset the jump in demand during the holiday season, and while you may have some workers returning from the summer, there is a chance you’ll have some new faces as well. According to the Occupational Safety and Health Administration, having rubber mats is a great way to add traction to the floors, protecting employees from any potential falls. Rubber mats are a great way to keep people safe, even if there is a spill, and they’re also easy to clean, which can come in handy when working in a busy restaurant. In addition to taking extra precautions for keeping employees safe, it’s also important to have a safety training while onboarding new employees. Modern Restaurant Management reports that even though you may be desperate to fill slots for the holidays, you need to make sure you’re bringing in the right talent. According to the news provider, you should try to stick to the same hiring principles as you would for your normal full-time help. Make sure that you’re hiring skilled workers who you would trust to be your full-time employees just as you would with temporary assistance.